Test on robots and technology. 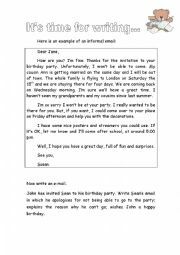 A test on teenagers´ ambitions about their future. 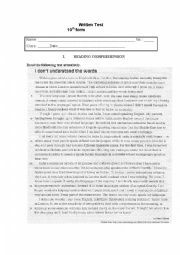 This is a test I gave my students on cinema vocabulary, as well as some grammar points (past simple, connectors, present perfect and comparatives)and writing exercise. Hi there! I hope this test is useful for you. 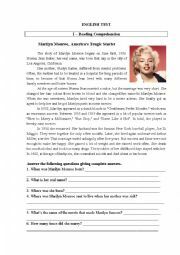 I gave it to my 10th grade students and it was about the unit "A World of many languages"
An english test for your students about jobs. A second version of a previous test on jobs. 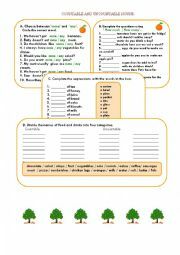 This is a worksheet to make students practise writing skills. I hope it´s useful! 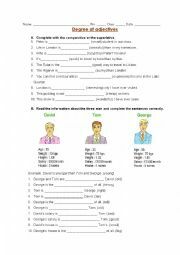 Here is a worksheet with exercises about the degree of adjectives.